If You Live Past Phase 2, Your Chances of Surviving the Project Go Way Up! Do the floors look like they hosted the tryouts for the zombie apocalypse? Or, even worse, do you have the kind of 70’s shag carpet that you’re afraid to walk on without making sure you’re up to date on all your vaccinations? Do your floors make you want to burn the whole place down, give up on society, and retreat to the wilderness to live in a cave? Well, put down that gas can and step back from the ledge, because it turns out that hardwood floor refinishing is well within the abilities of anyone who considers sharing real estate with hibernating animals. Let’s face it, hardwood floors are beautiful. Do you think Wyatt Earp had carpet in his house? No! Wyatt Earp had the kind of rugged, gorgeous, hardwood floors that exhibited a glossy, shimmering wood grain that can hypnotize a person for hours. Good thing too because Wyatt Earp didn’t have a TV. Hardwood floors are elegant, attractive, and durable. They’re one of only two things that are equally comfortable featured as the backdrop in the pictures of fashion magazines or lounging around in the cities of Middle Earth (Viggo Mortensen being the other). Chances are you might have hardwood floors and not even know it. Every decade or so, interior design “experts” lose their collective minds and usher in a design era that leaves subsequent generations to wonder, “What were they thinking?” (Remember those space age 60s houses anyone?). Checking to see if you have a wood floor hidden under some carpet is easy. Simply go to a corner or a closet, remove the molding, and pry up a section of carpet to see what’s underneath. 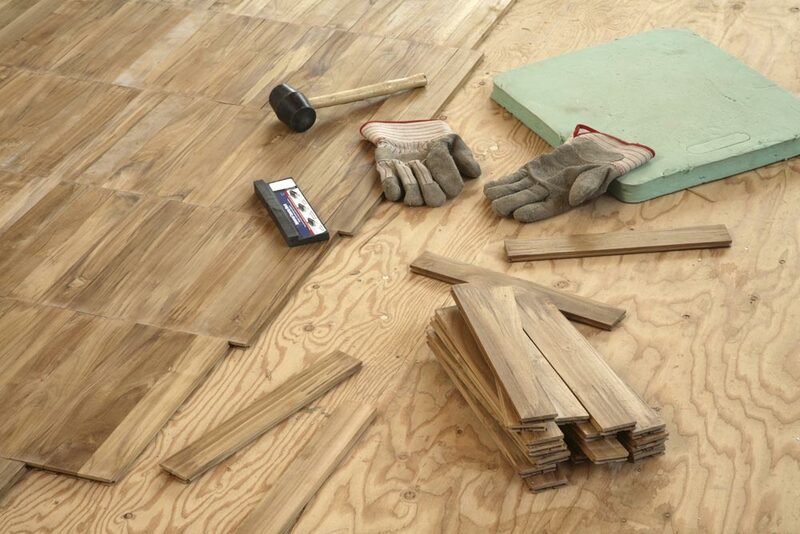 If your house is very old, the underlayment might be stuck to the floor so get in there and scrape it off being careful not to scratch the wood. If the underlayment is stuck or glued that does not prevent hardwood floor refinishing, it just adds the step of cleaning the floor with chemical strippers (don’t breathe that or get it on your skin, it burns). When Is a Hardwood Floor Not a Hardwood Floor? There are a lot of different floors that look like they’re wood but not all of them can be refinished. Don’t go rent an industrial sander, or start pouring chemical strippers on flooring unless you’re sure you have the right type of floor. Hardwood floor refinishing is relatively inexpensive, but replacing a whole floor is a different story. This is the one you’re looking for. Hardwood floor refinishing can be done on 3/4″ hardwood about 10 times during the life of the flooring. If you discover this under the carpet, you can celebrate because a hardwood floor refinishing project is going to look great, and add thousands of dollars to the value of your home. Engineered hardwood can be refinished, but this is not an ideal do it yourself project. The reason is that engineered hardwood has layers which you can see in the end grain. It is still possible to do a refinishing project on engineered hardwood, but you might want to leave it to the pros. 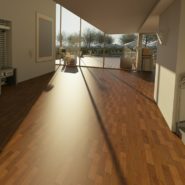 Laminate flooring can be as little as 8 millimeters thick and is made of resin and fiberboard rather than wood. You can’t sand it or pour polyurethane on it. Laminate flooring is relatively inexpensive and easy to replace when it has worn out. Why Is Hardwood Floor Refinishing Necessary? Remember those awesome hardwood floors Wyatt Earp used to stare at because he couldn’t watch ‘Deadwood’? A lot of those floors are still in use today. That represents a lot of boot and foot and hoof and paw traffic. In fact, you can often see high use areas worn into hardwood flooring (don’t worry, that’s fixed in the sanding). You can test if your floor needs to be refinished by pouring some water on it. If the water balls up, the floor is likely still good. 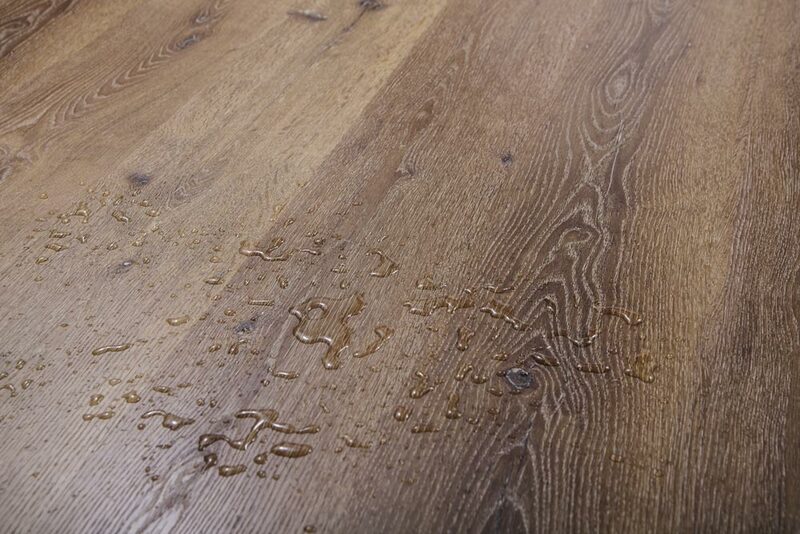 If the water gets soaked up by the wood, you need to refinish it. Either way, clean up after this little experiment, wet spots on the floor can be hard to explain. What Does Hardwood Floor Refinishing Cost? If you do a lot of home projects, chances are you’ll already have a lot of the things necessary for a hardwood floor refinishing project. 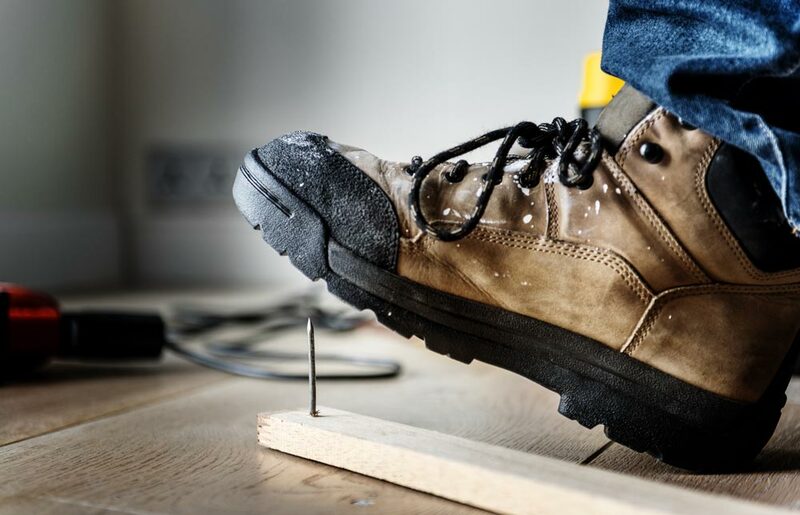 For things you don’t have, a project like this is an ideal opportunity to borrow tools and equipment from a gullible neighbor or relative without any intention of returning them. You could even potentially sell the borrowed items back to the original owner at a garage sale at a later date, and recuperate a considerable amount of the cost of the project. Win/win! A hardwood floor refinishing project is an ideal do-it-yourself project because it takes minimal equipment and experience. It does take a lot of time, however, so hiring somebody to do it for you becomes cost prohibitive. 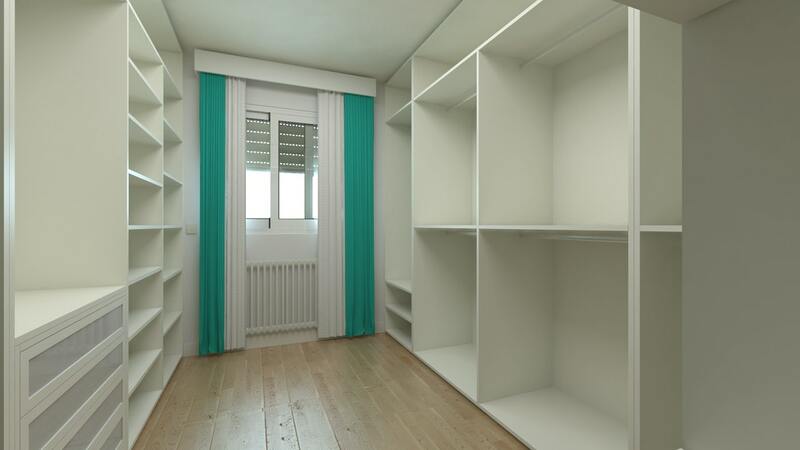 Determining the size of the room will allow you to get a rough estimate of the cost. 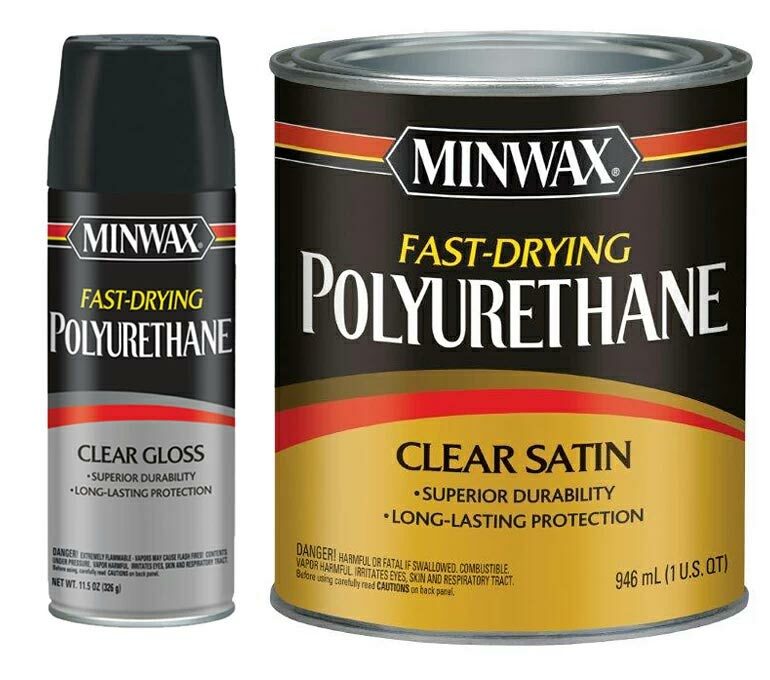 A gallon of Polyurethane costs anywhere from $35 to $55 and covers around 600 square feet. However, you won’t know how much your floor absorbs until you start to apply the Polyurethane. They don’t shoot you if you go back to the store to ask for another gallon. 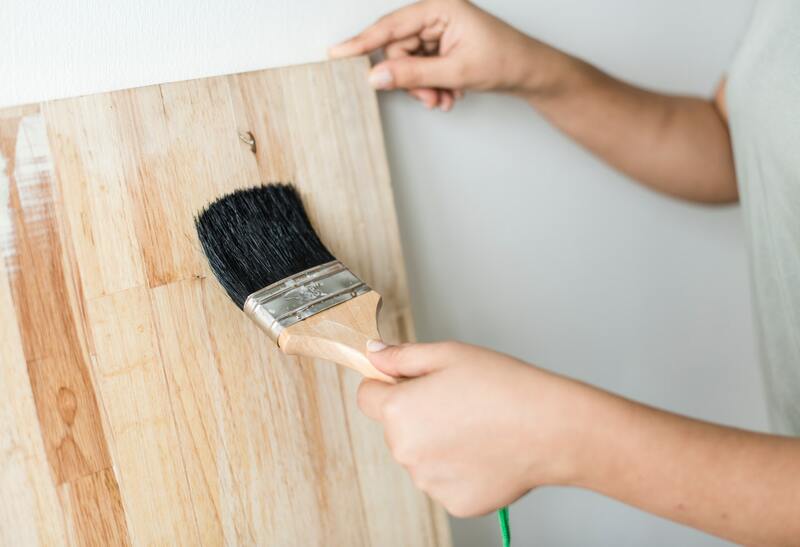 Refinishing a 15′ X 15′ room could cost anywhere from $250 to $1000 depending on local product costs, equipment rental fees and availability, and the tools you already have in your possession. This is going to seem like a lot of steps, but don’t freak out. You’re probably going to forget to purchase something, and you’re probably going to start a step and realize you’d like some other sort of tool. That’s okay! Hardware stores love the opportunity to sell you something else when you come back in. Now, when a lot of people do projects, they get in a hurry and they think they can save time by skipping steps. Like when I’m making cookies with the kids I often think, “Pshaw, I don’t need to pre-heat the oven!” or “You don’t really need to add flour!” The trouble is, when you skip steps you end up paying for it later (brings a whole new meaning to the phrase “tossing cookies”). Above all else, take the safety recommendations very seriously. Even the very worst do-it-yourself project is more fun and a lot cheaper than a trip to the hospital. Yeah, I know you think you’re tough, but the very first thing to do with this job is to go out and buy some knee pads. You’re going to be down on the floor a lot, and they don’t call it a hardwood floor because it’s fun to kneel on. Get a good, comfortable, lightweight set of knee pads. You won’t even notice that they’re on, and it will help you get through this project without transforming into a snarling, angry, exhausted beast who can’t answer a question without screaming after 10 AM. Seriously, nobody wants to be around you when your knees hurt. Kneepads are a lot cheaper than a divorce (I only wish somebody had insisted I bought knee pads, once upon a time…). 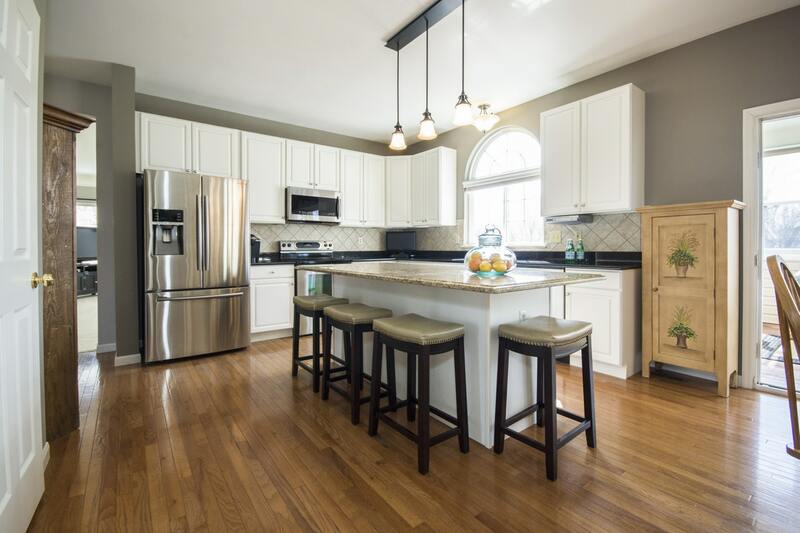 So, you’ve pulled up some molding, crawled around to have a look at the end boards, and determined that you do have 3/4″ hardwood flooring to refinish. Congratulations! The hard work is about to begin! Your first task is simple: take everything out of the room. This is the first big inconvenience of hardwood floor refinishing, but stay positive because it won’t be the last. It might be difficult to find places to store all your furniture, but I have faith in your ingenuity. We didn’t grow up playing Tetris for nothing, it’s time to put those skills to use! One thing to emphasize is that when I say everything, I mean everything. You might be thinking, “Well, he can’t mean the pictures on the walls can he?” Yes! I mean the pictures on the walls, get them out of there. Take out the curtains, take out the clocks, take out the end tables, take out the chairs and rugs. The reason that we’re taking out everything is because when you start sanding you’re going to get sawdust everywhere. 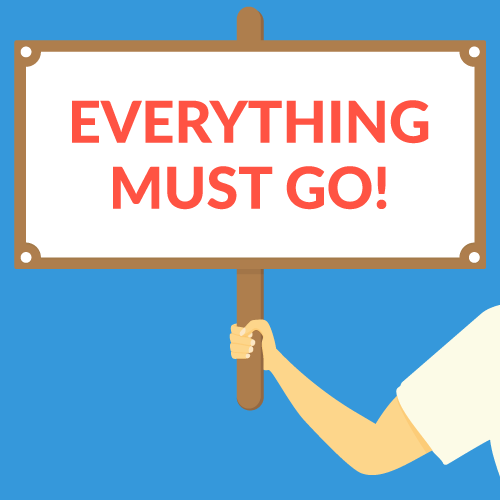 So, even though it feels like extra work to remove everything now, you’ll actually be saving time because you won’t have to clean the sawdust off your stuff later. So, I’m actually saving you time with this advice. The good news is that there’s nothing to purchase for this step, so you can begin your project without making any kind of financial commitment (this is good for people who are scared of commitment). I’ve seen many strong men begin cleaning the room only to give up and ring the bell. Only the strongest advance to the next step, will you be among them? Congratulations for making it to the next step, you are among the strong! Your heroic, warrior ancestors are looking down upon you from the great beyond with pride. But now your mettle is about to be tested. So, you’ve taken out all the stuff, now you have to pry up the molding. That’s the trim that goes along the floor next to the walls. 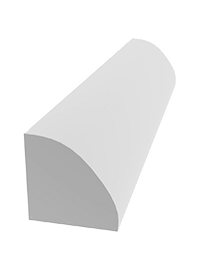 There are a lot of different molding types out there, but the most common is a 3/4″ triangle strip with a curved side. It might be possible to save the molding and reinstall it later, but that stuff can fight with you. Also, you’ll have to find a safe place to store it because it’s essentially sticks with nails sticking out at random intervals. That kind of thing is great for the zombie apocalypse, not so good for a daycare. If you want to try and reuse the molding, be sure to label BOTH the molding and the wall it came from. Write numbers on a piece of painter’s tape with a sharpie (don’t write directly on the walls), and apply the tape to both items. If you forgot to buy sharpies and painter’s tape, maybe your neighbor has some in his garage. Everybody aspires to save the molding, until they break the very first piece. Don’t worry about it, molding is cheap and all you need to replace it is a miter box, a saw, a hammer, some nails, and some time. If you never want to do another do-it-yourself after hardwood floor refinishing, you can even live without molding. Remove the doors, believe me, you can cause a lot of damage to a floor with a sander if you try to sand around a swinging door. It’s a bad idea. Just remove the doors. You don’t have to remove the light fixtures, let’s not get crazy. Also, you’re going to need some light to finish this project, working in the dark is dangerous. Essentially what you’re trying to achieve is to create a sealed containment room that will keep sawdust from getting into the rest of your house. By the time you’re done, it should look like when the authorities showed up at Elliott’s place at the end of E.T. (well, maybe not that extreme). Put plastic on the windows, put plastic on the vents, and put plastic on the entryways to the room. You’ll have togo in and out, so don’t seal the doorways to the floor. Now, get in there and vacuum! You’ll need a shop vacuum cleaner for this project. If they rent them for the week, go ahead and do it, this job involves a lot of vacuuming. If buying one is cheaper than renting one, do it, you can always sell it later. Or berate your cheap neighbor until he buys one and then steal his. If you have big cracks in your floor, you’ll need to fill them with wood filler. 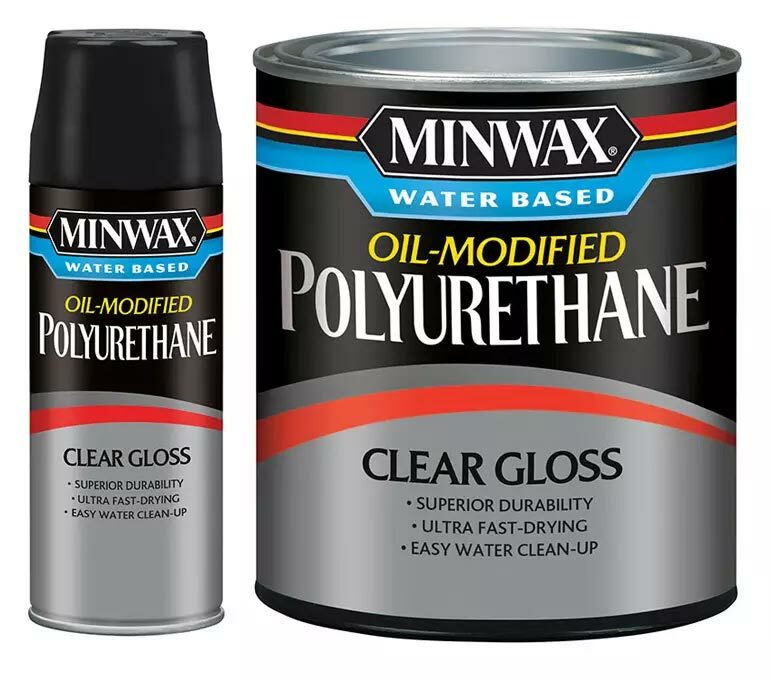 If you don’t do this, the polyurethane will drip through into your basement. Fill in the gouges a day before getting your sander so the wood filler has time to dry. Once you’ve sanded over the filled cracks you won’t even see them. Also, look for nails or staples sticking up out of the floor. Hammer in the nails and pull up the staples, or these will rip apart your sandpaper when you get to sanding. Whew! All done with Phase 1. But hold on to your hazmat suitedhorses, because Phase 2 really separates the eggs from the omelets! 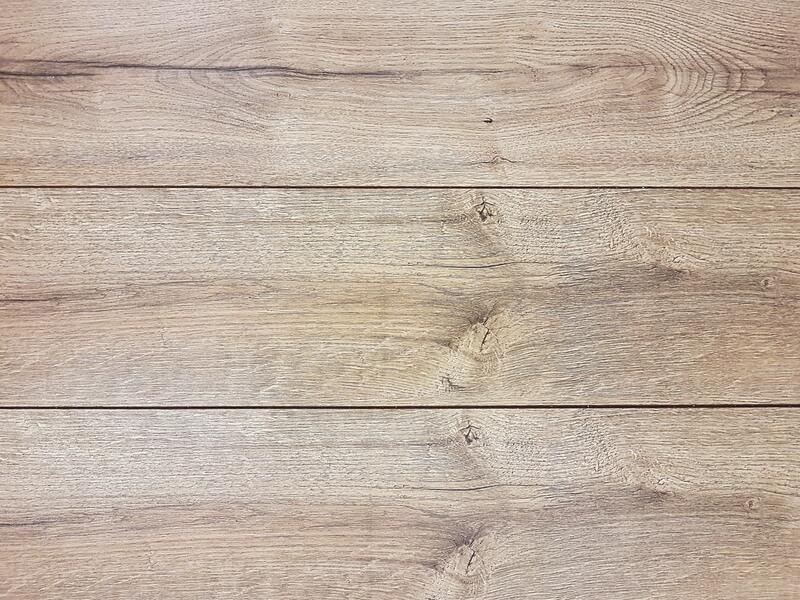 All wood floors are different, and some of them are made from harder and softer wood. Before you start whacking away at your floor with a piece of industrial equipment, it’s a good idea test a corner of the room with a hand sander. Pro tip: Don’t test in the middle of the room where everybody can see it if you make a huge mistake. Go to where the couch normally is and test there. If your floor is in relatively good shape, you might be able to skip sanding with the coarser grits. Do your test patch with 50 to 60 grit sandpaper and see how it looks. If nothing comes up go down to 30-40 grit. If you’re worried about damaging the floor, start with a 100 grit to get a feel for the job. Sanding a floor is the type of job where you go from hopeless novice to grandmaster in the course of an afternoon. Okay Jack Bauer, you’ve got 24 hours to sand your floor, this is because most hardware stores allow you to rent a sander for the day. Chances are, the sander at your local hardware store is not going to look anything like the ones you see online, but the guy who works there knows how to use it. Ask him. Almost all hardware stores allow you to rent some pretty awesome equipment. They have some extremely powerful stuff that you have no idea what it does. The next time you have a day off, it could be fun to rent some of that equipment and use it to destroy an old refrigerator you got off Craigslist. Pro tip: You’re already wearing your work clothes when you pick up the sander, things are about to get dirty. No matter what the sander looks like, it’s going to be heavy, and probably dirty. Also, there’s likely to be a bag filled with fine sawdust attached to it that you’ll have to empty. 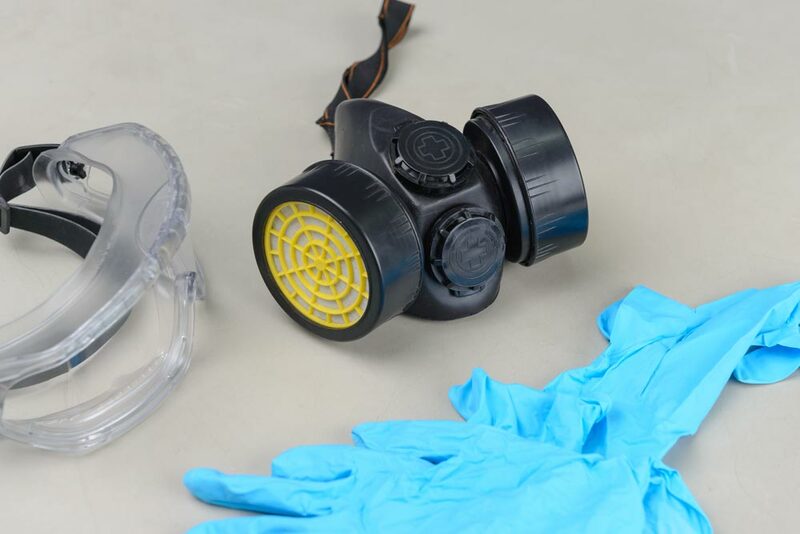 You should be wearing a respirator and safety glasses while you empty the bag, try not to get massive clouds of sawdust everywhere, you shouldn’t breathe that (Note: I’m serious). I hope your neighbor has a big car you can borrow, because anything smaller than a Subaru Forester is going to be a tight fit. Also, the sander is probably going to leave a big pile of sawdust, and goodness knows you don’t want that in your car. You’re going to find that renting the sander is inexpensive compared to the cost of the sandpaper. 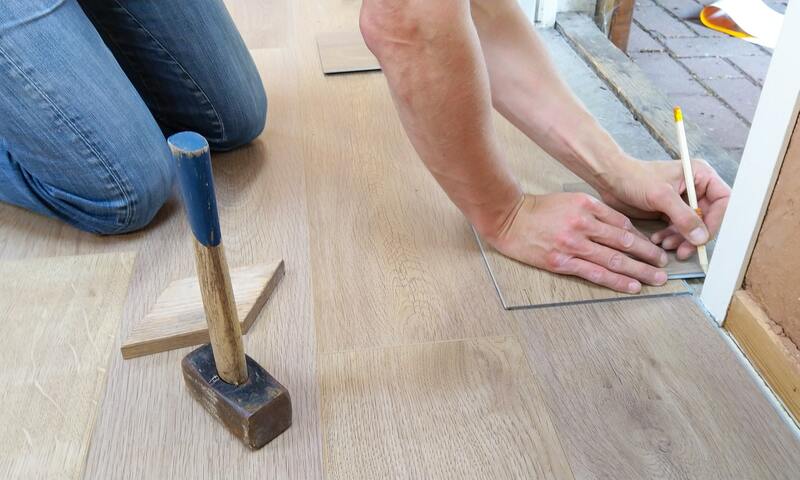 As you work on your floor, you’ll be swapping out sandpaper regularly. Buy three times more sandpaper than you think you’ll need and keep the receipt. You don’t want to run out of sandpaper in the middle of the night when the stores are closed. How does it feel to have a major power tool in your living room? Pretty great right? Yeah! Enjoy that feeling, let loose with a little howl of power (“Aruuuuuuuu!”). Okay, got that out of your system? Good, now let’s come back down to earth so you don’t misuse your sander and wreck your floor. At this point in the project, you have to think of your room as a “sterile room.” You aren’t tracking dirt, etc, in there. Have some of those paper booties by the door and put them over your shoes every time you go in. Also, have a respirator nearby, do not operate the sander without a respirator (I’m serious about not breathing saw dust). 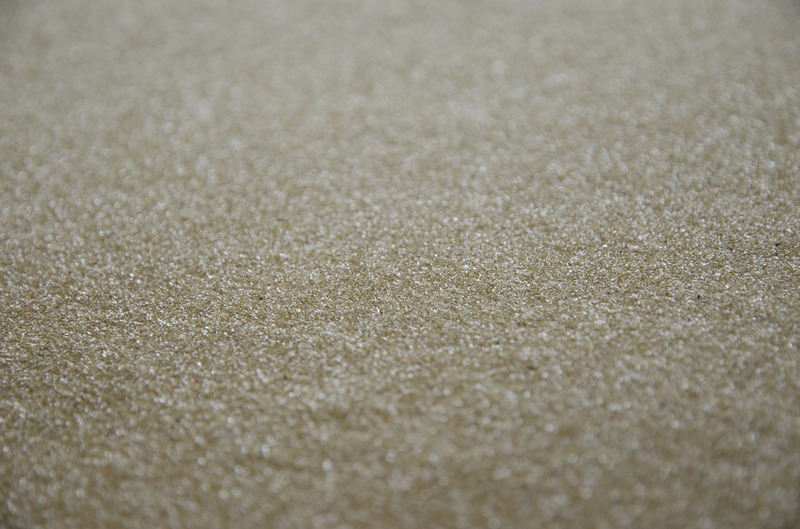 Apply the sandpaper grit you determined in your testing. 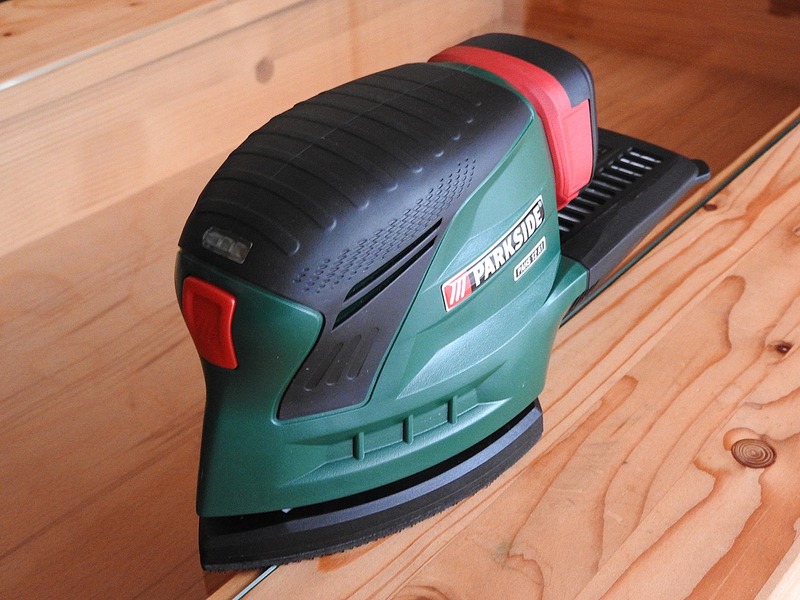 Take the sander to the unobtrusive corner of the room. Plug it in and hold on. Make sure that the sander is always moving so that you don’t leave big gouges in the floor. Change sandpaper when it seems like the sander isn’t doing anything anymore. You’ll also have to perform the sequence along the walls with a hand sander. Remember that 3/4″ of the floor will be covered by molding, so don’t stress yourself out too much about places you can’t reach. Vacuum the floor and then go over it with a damp mop to pick up sawdust. You don’t want to seal sawdust and dirt into your floor. Try not to use too much water on this step, you don’t want to soak the floor, you just want moisture on the mop that will pick up the sawdust. Go wake up your neighbor and demand to borrow his car so you can return the sander, or better yet, just make him take it back. You’ve got more important things to do, as the beeping clock ticks down to zero and the nation is saved, you are preparing to move on to phase 3! You’re at the fun part now, about to see real progress from all your hard work. You can apply an optional layer of sanding sealer before your first layer of polyurethane, but if you want to go straight on to the good stuff, I like your style. There’s no need to stain your floor unless you want to change the color. Clear-Gloss is the best option for a floor because the dulling agents that are used to reduce the glossiness also reducing the hardening. Clear-gloss will, therefore, give you the most durable floor, and it will dull over time. It also looks the best. Please wear a respirator, safety glasses, pants and long sleeves. When you’re painting liquid can fly off a brush and you don’t want this in your eyes, you really don’t. You can’t wash polyurethane off your skin with soap and water, you need some Goop hand cleaner or an equivalent. Polyurethane gives off fumes you don’t want to breathe, so wear a respirator while painting. Also, you should leave the house for one night after every layer of polyurethane. The fumes go away in 24 hours and the house becomes safe. You need to use a good quality polyurethane brush. Cheap brushes shed hairs that become permanently sealed in your floor. 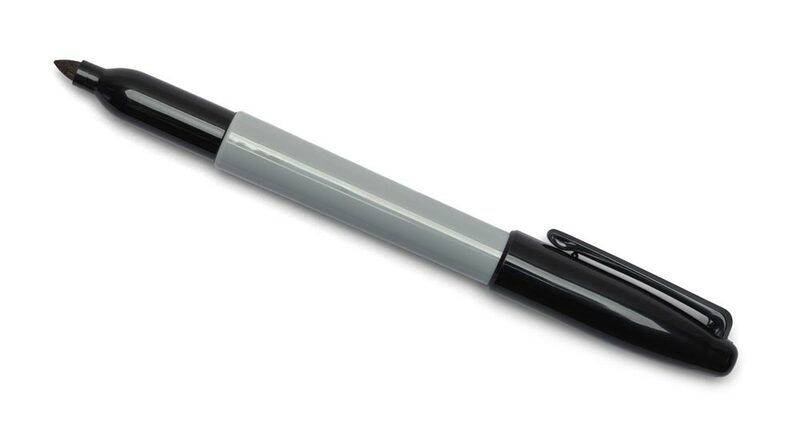 Some places recommend using an applicator, but those tend to leave unattractive bubbles in the finish. Get down on your knees and apply a thin cover layer over the whole floor (aren’t you glad I insisted on those knee pads?). Don’t go too thick or the polyurethane won’t cure properly. Be sure not to paint yourself into a corner, or else you’ll have to sit there all night with nothing to look at but wood grain like Wyatt Earp used to do in his living room. Apply two or three coats as needed, and give the floor a couple days to cure before moving your furniture back in. If you walk on the polyurethane when it is tacky you’ll leave footmarks. You’ve put too much time into this project to screw it up in the closing credits! Congratulations Champ! You Killed it! That’s it! You finished. See? And you thought hardwood floor refinishing would be hard! But you’ve vanquished the zombie apocalypse, defeated the ticking clock, and restored value and beauty to your home. Now when Viggo Mortensen and Wyatt Earp come over, they’ll treat you like the true king of Gondor. Your neighbor will be jealous too, but what else is new?